The board is Lovenskate wood, pressed with care in the USA, then shipped to the UK and screen-printed at Lovenskate headquarters in London. 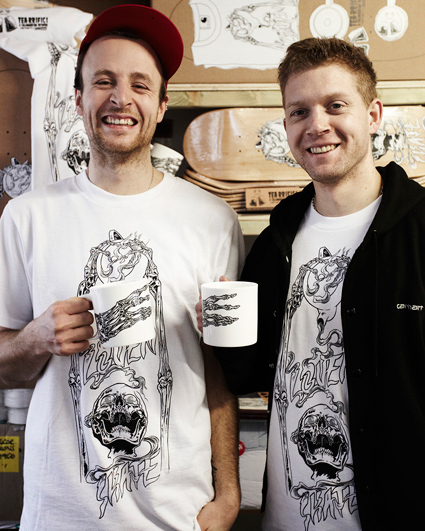 Once made in Stokeon-Trent, the teapots and mugs are screen-printed by hand and fired in the kiln, also at Lovenskate. Sticker packs mean the tea celebration can make its way into all parts of your life, and if you’re lucky they’ll smell of polyplast ink. Finest Carhartt shirts will get the Lovenskate treatment before they make their way into this box and last but definitely not least, there will be a couple of Traditional English Breakfast tea bags to set off the whole operation as it was intended. Ten years ago, surrounded by scissors, photocopies and glue in his room, Stuart Smith began piecing together a fanzine with a screen-printed cover and some scribblings about exploring the world on your skateboard. Lovenskate was born. More people eventually became involved and contributed writing and photographs and now it has grown to the point where it is a company in its own right, transforming the ideas of a close group of friends into reality. Skateboarding brought together many like minds and Stu’s skills made their projects possible. Stu’s own words on this subject best convey Lovenskate´s whole ethos: “The screen-printing binds the whole thing together. We have loads of creative friends, artists, illustrators, designers, all skateboarders, we go skate, drink tea and talk nonsense, and we come up with ideas, and in one day we can make a new board graphic, or a T-shirt, something stupid or funny that gets us excited about skateboarding, and we can just print it and make a product in our little studio in East London, and ‚cause we can do it just like that, punk style, POW! it still keeps all its energy, and its spontaneity, and fun. That is how we like to do it.” The Lovenskate team consists of Alex Barton, Lucy Adams, Craig Questions, Liam Sproat and Ewen Bowler. Their headquarters is in Bethnal Green. You haven’t heard the last from this crew of like minds. Stay abreast of any new developments at www.lovenskate.com. The driving force behind Lovenskate is Stuart Smith. Stuart grew up skateboarding in Maidstone in Kent, he quit his job at Burger King 16 years ago when Saturday skates at the Maidstone law courts seemed more appealing. He is now 32. He met Graham Mitchell, whose artwork decorates the Tearrific collaboration, at a club night in Maidstone. Although they nearly had a fight that night, they found they were in the same college class a week later and have been friends and skated together ever since. Both of them moved to London for university in 1999 and have lived together pretty much ever since then. Stuart’s involvement with Carhartt came about through his good friend French who was set to illustrate a T-shirt and suggested Stuart’s screen printing company finish the job. Relations have been strong since then, seeing Stu print shirts for Hellfest, the ESC, many of French’s Carhartt-related illustrations and a lot of interesting printed products for book and record releases. From all of this came the opportunity for Carhartt and Lovenskate to merge with this collaboration. But we thought we could push this idea a bit further and we created a more complete set, a bit more exclusive but still friendly, as a limited box set edition. 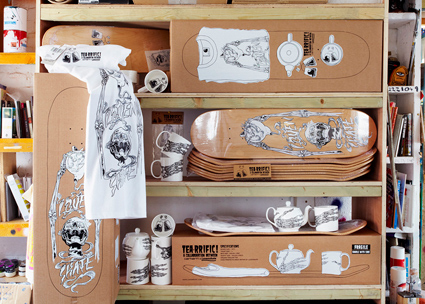 The Tea-riffic board and mug are available through Carhartt and Lovenskate’s retail network. The box set will be available from www.lovenskateshop.com only and is limited to 30 pieces. T-shirts and teapots will only be available in these box sets. A BRIEF GLANCE #5 ONLINE!